Hawaii, the 50th state of the U.S is a group of 8 major islands and many islets. Nestled in the central Pacific Ocean, the Aloha State, as it is called, has Honolulu as the capital and is the largest city. You can avail many a travel package to Hawaii, one that suits your needs and budget - be it luxury cruise travel or a backpacking trekking travel to Hawaii. We encapsulate the many splendors and scenic spots that you must visit on your travel to Hawaii. Look up our Hawaii travel guide - for tips on weather, accommodation and holiday activities. Learn more about Honolulu travel and travel to Maui. Travel to Hawaii - brings to mind visions of abundant sunshine, coral beaches with rolling white surf, cloud-covered volcanoes, vast expanses of lush green vegetation and cultural feasts. Hawaii is a land of many attractions - water sports, sightseeing, nightlife, cultural extravaganza and more. This state is composed of nearly 60 ethnic groups. The Polynesian culture is predominant throughout the state. 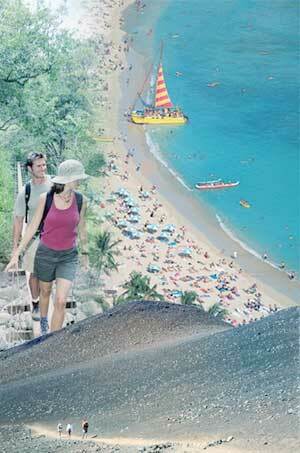 Whether you are looking for a hiking trip, family holiday or romantic rendezvous, Hawaii promises all of it and more! Nearly a third of the endangered species of the U.S. are found in Hawaii. From the Humpback whale to the Pacific Green Sea Turtle to the Pueo or the official state bird - Nene Goose, Hawaii is home to exotic species. If you can manage to roll this on your tongue, the unofficial fish of the state is humuhumunukunukuapuaa. The islands are home to 29 endangered bird species and 19 endangered plant species. The winter months of December to February are the most popular for Hawaii travel. But if you want to make use of off-season discounts, opt for the season from April to mid-December. Surfing is best around Christmas time while windsurfing and diving is popular in summer. Travel to the Hawaii islands and enjoy the renowned spirit of hospitality and warmth that the people exhibit. If all you are planning is a short 3-day travel package to Hawaii, you can take the best of the Big Island, Maui and Oahu. Visit Iao Valley and travel to Lahaina. Bask on the sun-drenched Kohala Coast and Punalu Beach Park. Most travel packages to Hawaii would include a trip to the Kona Coffee Living History Farm - a coffee and macadamia nut farm that brings the history of coffee to life. The island of Kauai - a circular island that boasts of nearly 97% of conservation efforts or agricultural land. A luxury travel package to Hawaii will let you experience the splendors of Honolulu, Oahu and Maui in the luxurious ambience of quiet holiday resorts and ocean view condos. Sample traditional food, music and dance amidst the backdrop of stately palms and scenic oceanfront views. Experience the Hawaiian culture and diverse terrain. You can explore the islands in a rental car. The 2-hour drive down the legendary road to Hana takes you through lush scenery and friendly villages and ranches and fine waterfalls. Arm yourself with details and information on some of the lesser-known beaches that can be a safe and private haven for a tourist. Hawaiian travel package comes as cruise ride on luxury liners too. Typically these cruises last for a week or two. You can enjoy the ports of call - Hilo, Kailua Kona, Kahului and Honolulu. The volcanoes of Big Island are a must-see - Mauna Loa, Kilauea, Hualalai, Kohala and Mauna Kea. If you travel in winter, you will be able to catch the snow-capped peaks of Mauna Kea and Maua Loa. A travel package of the volcanoes and valleys of Hawaii will take you through lush tropical forests and sea cliffs and craters. Experience the fiery power of the Kilauea volcano. You can see steaming craters and cooled lava tubes. Explore Hawaii Volcanoes National Park. A helicopter ride over the jagged mountains and beaches will let you see the splendors of nature that this beautiful island offers, from the amazing rainforests of the Hamakua Coast to the Waimea Canyon and the Na Pali Cliffs. Arm yourself with a good Hawaii travel guide before you head for the scenic islands. The climate is generally consistent and enjoyable in Hawaii. The typical climate in the Hawaiian Islands is moderate tropical. Warm Pacific winds blow throughout the year. Average temperatures in Hawaii hover around 23 degrees C. There are fluctuations based on the location within the tropical islands. It can be freezing cold near the summit of Mauna Kea and humid and warm in the Big Island. The eastern side of the islands receives high rainfall as compared to the western locations. During the winter months of November through April, there are mild showers and windstorms. There is moderate to heavy snowfall on Mauna Kea on Big Island and Haleakala in Maui. As any Hawaii travel guide would tell you, you could get an economy hotel room for about $49 - $89. While a deluxe room would cost you in the range of %150 - $300, luxury accommodation would cost you upwards of $350. If you are heading on a Hawaiian holiday, don't forget to carry along your skin moisturizer and suntan lotion. Pack along some groovy bathing suits and beachwear. Arm yourself with a sunscreen with a minimum SPF of 15. Don't forget to carry along a sun hat or head covering. Hiking shoes are a must-have when traveling to Hawaii. Pack some casual sporty clothing like shorts, tank tops, tee-shirts and skirts. A backpack is good for the day out, to carry along your essential items. An important Hawaii travel tip for those traveling with kids is to bring along comfortable walking shoes or sandals and a stroller or baby tote if you are traveling with an infant. Hawaii is the preferred destination for water sports lovers. While beginners can surf on the waves at Waikiki, the professionals can head for Oahu's North Shore. The Hookipa Beach at Maui is the windsurfing destination at Hawaii. There are plenty of diving opportunities with underwater caves, canyons, vertical walls and sunken ships. The volcanic crater of Molokini - Lanai is yet another exciting diving spot. You can go deep-sea fishing for tuna and spear fish along the Kona Coast of the Big Island. Go kayaking along the beautiful Hawaiian coastline. The underwater coral landscapes with colorful tropical fish are a snorkel's delight. As any Hawaii travel guide would tell you, the Haleakala National Park and Na Pali are preferred destinations for hiking enthusiasts. Submarine rides and whale-watching, parasailing and ocean rafting, Hawaii travel packages offer it all! Many a romantic couple is inspired to exchange nuptial vows on the romantic Hawaii Island resorts. With the backdrop of fragrant tropical gardens and golden sunsets, Hawaii is a popular spot for island weddings. Enjoy a traditional Luau feast while on a Hawaiian holiday. The Kalua pig forms the main course - stuffed with and wrapped in ti leaves and baked all day long in an underground oven. The tender pork is served along with poi - a purplish gray paste made from pounded taro. Other delicacies are marinated salmon (lomi salmon) and fish and pork wrapped in luau leaves (laulau). Honolulu means 'protected bay' - protected by the Koolau Range to the north and Sand Island to the south. Honolulu Hawaii is a popular travel destination, with its beautiful beach at Waikiki and Diamond Head, an extinct volcano allowing a 360-degree view from its summit. Before heading for Honolulu Hawaii travel, arm yourself with maps covering downtown Honolulu and its neighborhoods. Honolulu is the business and financial center of Hawaii. Honolulu boasts of a history dating back 150 years as the Hawaiian capital. Check out Chinatown for delicious Chinese, Thai and Vietnamese restaurants. Waikiki is probably the most popular destination for all Honolulu Hawaii travelers. Watch the beautiful blue waves break against the white sands, enjoy the shopping expedition on Kalakaua Boulevard and surf and play on the beach front. Visit the Honolulu Zoo, Waikiki Acquarium and Kapiolani Park. Shopaholics can indulge themselves in Honolulu's Ala Moana Shopping Center - probably one of the country's largest open-air malls. Don't miss Ala Moana Beach Park for swimming. No visit to Honolulu is complete without visiting the USS Arizona Memorial - a tribute to the men that lost their lives in the Pearl Harbor bombing. There are interpretive programs and documentary films as well as a boat rip to the USS Arizona Memorial. The Honolulu Academy of Arts has a wonderful Asian collection. The Bishop Museum is the Hawaii State Museum of Natural and Cultural History. It has on display photographs and crafts of native Polynesian origin. When in Honolulu, look up the Iolani Palace that was home to King Kalakaua and Queen Lili'uokalani. A guided tour on the Pineapple Express will take you through the gardens and plantations of the Dole Plantation. Enjoy shows and cultural demonstrations and recreations of Polynesian villages at the Polynesian Cultural Center. A snorkeling enthusiast would not miss the Hanauma Bay Natural Preserve. Get up close and personal with dolphins at the Dolphin Quest in the center of the Kahala Mandarin Oriental Resort. For a fascinating peek at the marine and reef life of Oahu, get aboard a submarine trip. With a tour lasting about 45 minutes, you can take an intimate look at the wonders of the sea. The island of Maui owes its name to the demi-god Maui - a diety in Polynesian culture. The island resembles the head and torso of a man. Travel to Maui in Hawaii to experience the hidden beaches and lush country forests. The sunny western coast of Maui is lined with white-sand beaches and the waters are teeming with humpback whales. Known as the 'valley island', Maui has a central valley formed by 2 large extinct volcanoes. Travel to Maui in Hawaii for exotic beaches ranging from pearl white to volcanic black. Maui boasts of 120 miles of coastline, known for its pristine beaches. While you laze around on the famous Kaanapali or Wailea beaches, you can also look out for some smaller beaches tucked away. Pamper yourself with a spa treatment at Wailea. Hike through Haleakala Crater or enjoy an afternoon of snorkeling on the tropical reefs of Maui. Adventure activities for Maui travelers range from jet skiing, catamaran cruises, skim boarding, boogie boarding and windsurfing. Take in the timeless charm of Lahiana, which is a National Historic District. Hop aboard the Lahiana-Kaanapali and Pacific Railroads to visit the plantations.